In line with a similar post regarding the Presidents of South Africa, it has struck me how many of the Presidents of the French Republic are armigerous, either via inheritance or by becoming Knights of Foreign Orders of Chivalry. President MacMahon bore the arms Argent, three Lions passant Gules, a Chief Azure semy of stars Argent. President de Gaulle; whilst I believe he was from an armigerous family. Bore the arms: Tierced per pale Azure , Argent and Gules, on the centre Pale a Patriarchal Cross Gules, as a Knight of the Swedish Order of the Seraphim. President Poincare bore the arms: Azure, the letters R and P conjoined Or, as a Knight of the Order of the Seraphim. Last edited by Jonathan Webster on 20 Sep 2012, 14:34, edited 1 time in total. Jonathan Webster wrote: President de Gaulle; whilst I believe he was from an armigerous family. Bore the arms: Per pale Azure , Argent and Gules, on the centre Pale a Patriarchal Cross Gules, as a Knight of the Swedish Order of the Seraphim. From where did that blazon emanate? Doesn't sound right to me. To part a shield 'per pale' is to divide it in two, palewise. Surely that should read 'Tierced per pale ... '? Yep ; correct, my mistake: that blazon was by er, me. I did know that; but easy mistake to make when doing it in a hurry. :S With most of the arms of the French presidents as Knights of the Seraphim, the arms simply incorporated elements from the Presidential standard of the President in question. In de Gaulle's case; the flag of France was borne on a shield, and the 'Cross of France Lorraine (symbol of the French resistance.) was put on the centre pale. This is a description of DeGaulle's standard as president of the French Republic. There was also a version with his initials "C.G." above the cross in gold. I'm not sure if you're saying that the double-barred cross is used by virtue of DeGaulle's knighthood, or that he used these arms as a whole in his role as a member of the Order of the Seraphim. But for the sake of clarity, the cross is the Cross of Lorraine, symbol of the Free French Forces (FFL); it is merely coincidence that two-barred crosses also appear in the collar of the Serafimerorden. Here's the Seraphim stall plate for President Francois Mitterand. 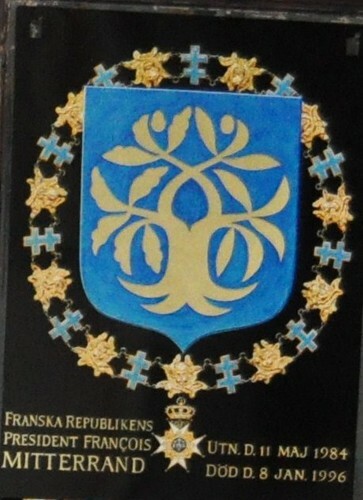 Again, the arms show the emblem chosen by Mitterand for his presidential standard (a tree that is half oak, half olive) in gold on a blue field. Jonathan Webster wrote: President de Gaulle; whilst I believe he was from an armigerous family. Does anyone have any idea what this connection was and whether it was from his father's or mother's side of the family? Gaule (de) D'azur, au lion d'argent, armé et lampassé de gueules, couronné d'or. Jonathan Webster wrote: President MacMahon bore the arms Argent, three Lions passant Gules, a Chief Azure semy of stars Argent. I found this blason rather interesting, because the chief is similar to those used by Dukes of France (a chief gules semy of stars argent) or those of les princes grands dignitaires (a chief azure semy of bees Or). It almost makes me wonder if Monsieur le President knew of the similarities, or if he just had an appreciation for the night sky. Er; I think it was Gules actually. :S Sloppy blazoning on my part again! President MacMahon was made Duke of Magenta by Emperor Napoleon III and bore the red chief accordingly. Yes; they were his ancestral i.e. his paternal arms.